Rita R. Gascon, age 81, passed away Thursday evening, February 7, 2019, at her home in Gross (Flat Rock), with her daughters by her side. Rita was born on March 22, 1937, in Escanaba, the daughter of William and Jeannette (DeShambo) Schultz Sr. She was raised in Wells and Gross (Flat Rock area) and was a graduate of Escanaba High School. On June 21, 1958, Rita was united in marriage to Edward “Jack” Gascon, at Holy Family Church in Flat Rock, and together the couple made their home and raised their two daughters in Gross. Rita provided a wonderful family home for Jack and the girls. Once her daughters were grown, Rita provided childcare in her home for many years to follow. 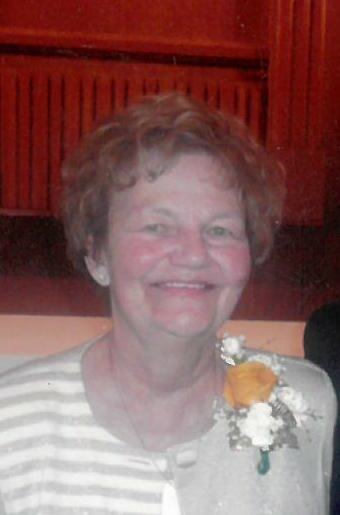 Rita was a member of the Holy Family Catholic Church in Flat Rock and a member of the Holy Family Alter Society. She belonged to the Knights of Columbus Auxiliary and the Delta Merry Mixers Square Dance Club. Rita loved to go dancing, camping and enjoyed baking, cooking and gardening. She would often bake for family and friends and donate homemade dishes to them. Rita and Jack spent many wonderful years wintering in Florida. She will be deeply missed. Brother: William (Sherri) Schultz Jr.
Also surviving are Rita’s many nieces, nephews and cousins. Rita’s family will receive friends on Wednesday February 13, 2019, from 4:00PM to 7:00PM, at the Skradski Funeral Home in Gladstone. Vigil prayers will follow visiting hours, at 7:00PM on Wednesday, at the Skradski Funeral Home, with Rev. Fr. Francis Dobrzenski of Holy Family Church officiating. Mass of Christian Burial will follow on Thursday February 14, 2019, at 11:00AM, at Holy Family Church in Flat Rock, with Rev. Fr. Francis Dobrzenski presiding. Luncheon will follow in the Holy Family Parish Hall. Rita will be laid to rest next to her husband Edward in the Gardens of Rest Cemetery following luncheon. Contributions in Rita’s name may be directed to Holy Family Catholic Church, St. Vincent DePaul or the Escanaba Knights of Columbus. Envelopes will be available at the Skradski Family Funeral Homes. The Skradski Family Funeral Homes of Delta County are assisting with arrangements. I will always remember her smile, kindness and sense of humor. I have such great memories of seeing Her with Gram, Aunt Kay and others playing cards. I can still hear them laughing and telling stories. Sorry for your loss Brenda and Laurie. Laurie and Brenda so sorry to hear of the loss of your beloved mother . May she rest peacefully . Rita had such a loving heart and loved to laugh. She touched the lives of so many kids, and fortunately my kids were impacted by her kindness and care for so very many years. She blessed our lives and we are sad for your loss Brenda and Laurie.